Our No. 9 pounce wheel is ¼” in diameter and has 21 teeth per inch and is beveled to the center. The pounce wheel is made of polished aluminum, which allows for a better grip and are non-slip. All of our pounce wheels are made of hardened steel for longer lasting, sharp teeth. Pounce Wheels are attached to the lightweight tapered handle for greater control. They also feature a hardened steel ball bearing for a very smooth swivel for greater control in following arcs and circles. Can also be locked for straight work. Used by sign makers, quilters, sewers, or anyone in need of a high quality pattern tracer. Great for splicing thin pieces of film and metal. 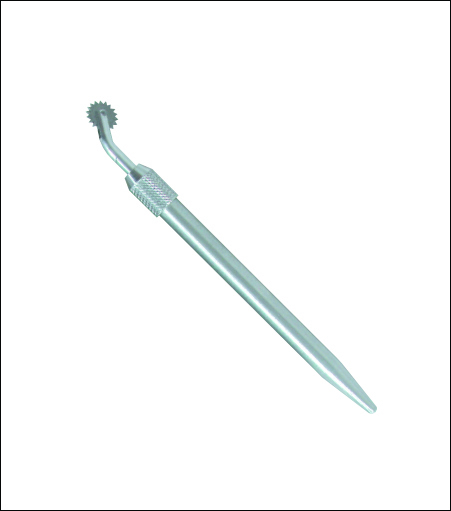 Also used as a rivet stimulating tool in the building of small model boats, cars and airplanes.